For over a decade Gloria Tamerr Petyarr has produced works of art that have constantly reshaped our understanding of contemporary central Australian Aboriginal art. Her identity as an artist rests comfortably in duality with her cultural and family responsibilities. Easing between these two worlds with immense presence and grace, Gloria continues to practice the fine art of life perpetuating her culture and her artistic pursuits. 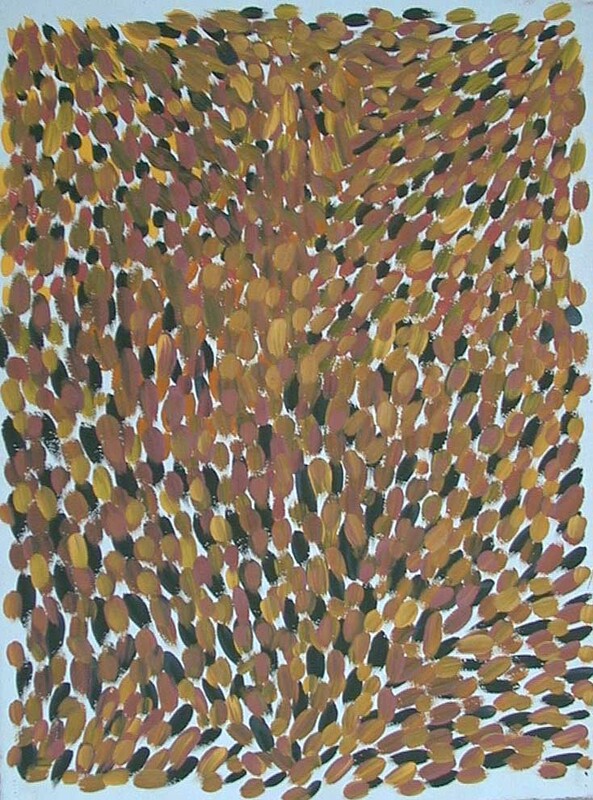 Gloria is perhaps our most exhibited, travelled and diverse living Indigenous artist. Her works have been acquired by major public institution and countless private collections both within Australia and internationally. She is regarded as being at the centre of painting in Utopia's history; an artist whose originality and diversity exemplifies the evolution, particularly of women`s art from the eastern region of Central Australia. Her work represents her Anmatyarr cultural heritage and the stories of Anungra, her country. Her affection for her favourite story, of Arnkerrth, the Mountain devil lizard, comes from the heart, her career and work bearing testament to this inseparable relationship which provides the inspiration, spiritual beliefs and economy for this remarkable artist. Arnkerrth's (pronounced An-gert-a) story centres around the journey of two Apetyarr and two Kngwarreys who travelled in a line bringing to the country of Anungra, it's dreamings, laws and ceremonies. Through the use of abstraction and repetition, Gloria`s articulation of her Awelye has taken on many representation, whereby her brush work has enabled her to continually open up fields within the canvas. Her ability to constantly re invent the visual representation of her story is unsurpassed, rendering this artist, the most diverse of this international art movement. Notions of identification and categorisation of her subject matter are subverted by an artist who rests her thinking in the concepts of multiplicity and plurality. Always drawing from her story which is inseparable from her culture, Gloria`s work represents one of the most powerful attributes of Central and Western Desert art. Where as rational western thinking catergorises objects, identifiying the singular by naming, grouping or coding, Gloria has extended the visual language of her story as her career has evolved. She continually adds to and broadens the language of her story and country, her subject matter remaining the same, while her visual representation and identification of her dreaming continues to explore new horizons. It was the culmination of batik techniques coupled with the early referencing of body stripes associated with Awelye, womens dreaming, that uniquely positioned artists from Utopia at the fore front in a new direction in painting. Where as painting in the Western Desert which was also constructed from ceremonial knowledge used formal designs of mens sand paintings, artists in Utopia who were predominately women, approached the canvas with looser and more direct painting practices associated with the inscriptions of body designs. Body Stripes and broader concepts of country, where tiny dots articulate topographical notions of the 'lay of their lands', have emerged from Utopia as immediately identifiable features of their art. During this unsurpassed period of art production in Australia's history, Gloria has continuously expanded and elaborated these contemporary visual languages. Painting, therefore is an incredibly diverse language Gloria speaks. Her direct and confident approach to the canvas is quietly balanced with periods of ceremonial singing, as she sings her story into the fibres and liquid marks of her painting. 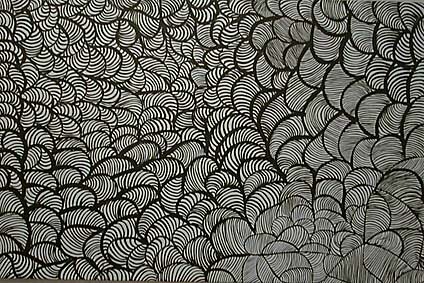 Her arching and ever present lines are sourced from her cultural vocabulary and abstracted within the repetition of line or brush stroke. Gloria`s playful marks are a reflection of her delight in consuming the void of a new canvas which, laid out on the ground in front of her, beckons to be filled in. Her open field is approached with a knowledge of the lay of her land, while her palate is a selection of contemporary colours from her country.